Life has been pretty busy this summer. Time is flying by while friends and family are having birthdays and other celebrations. I have “resigned” myself to making birthday cards with a little help from my stash of patterned paper packs. I tend to hoard my patterned paper and this helps me reduce my stash, so I have more room to buy more patterned paper! LOL! Help, I’m in a buyer/hoarder loop! Using patterned paper relieves me from the stress of choosing a color scheme. I just pick up the colors from the patterned paper in my inks and solid cardstock. The patterned paper also saves me time in stamping a background. When I first started making cards, I felt that I had to create everything from scratch from the color scheme to the patterned background if I was using one. But as time went on, I saw the folly in this belief. Card making is all about putting different design elements together to create something that is pleasing to the eye. Therefore, it doesn’t matter if you get a little help from patterned paper, store-bought embellishments, stickers, etc. I’m sure this revelation is nothing new to other card makers, but it took a while for this to come to me. I used a 6×6 patterned paper from Pinkfresh Studio’s Felicity collection. I love the particular color combination because it is bright and cheerful. Since the pattern was a little busy, I decided to partially cover it using a cover up die from My Favorite Things. The openings in this cover up die still allow the pattern to show through, but not so much of it as to be distracting. 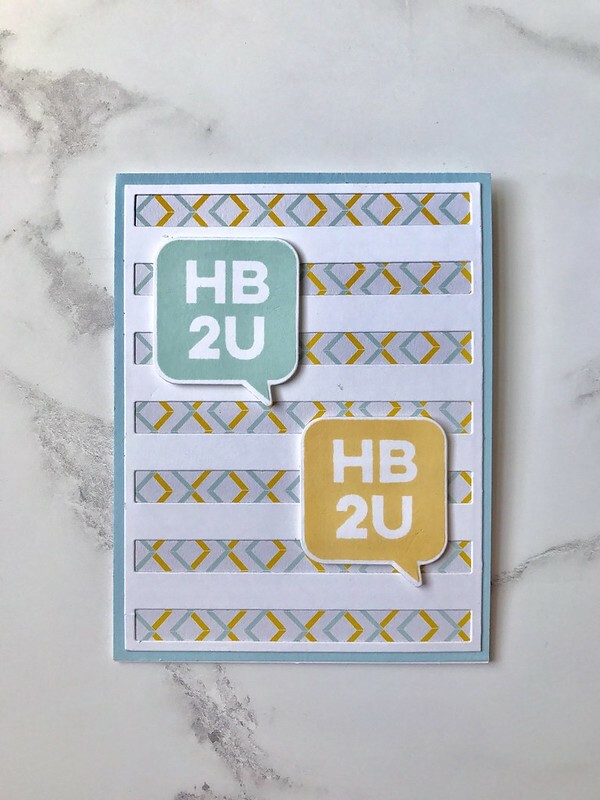 The cover up die cuts out an area that is slightly smaller than an A2-sized card, so I cut the patterned paper down to the same dimensions as the cover up die. The patterned paper was adhered to the back of the cover up piece. I found a piece of pale blue cardstock from my stash that matched the blue in the pattern and used it to mat the card front. The 2 speech bubble sentiments were stamped in inks that were similar to the colors in the patterned paper. I die cut the 2 stamped speech bubbles using their coordinating die and mounted it to the front of the card with foam tape. The entire front and mat were adhered to a top-folding, portrait-oriented, A2-sized card base. I was pleased with the result and so was the recipient. Hope you like this card! Stamps: My Favorite Things: Birthday Speech Bubbles stamp set. Inks: Papertrey Ink: Aqua Mist and Harvest Gold. Paper: Patterned paper from Pinkfresh Studio: 6×6 Felicity paper pack; Neenah Solar White 80# for cover up die; for the mat for the card front, I found a piece of scrap that matched the blue in the pattern; for card base: Neenah Solar White 110#. This entry was posted in Birthday, Occasions and tagged My Favorite Things. Bookmark the permalink.